HUNTS POINT — More than three years ago, 45 mechanic and auto-body shops agreed to move from their Willets Point storefronts to a large warehouse in The Bronx, after the city took over their properties for a massive redevelopment of the area. Now, those shop owners say they’re being evicted from their new home over unpaid rent, after struggling in a location far from their usual customers in the Iron Triangle. The cooperative, made up of 45 businesses, received more than $7 million from the city to move the shops to The Bronx and build out a new home for themselves. They turned down individual buyouts and instead chose to pool their money for the new facility, to maintain the one-stop-shopping convenience for drivers looking for repairs. But since moving to The Bronx, it hasn’t been easy. The cooperative filed for bankruptcy last fall. And now, after failing to pay months of rent on their large warehouse, they’re getting the boot — and pleading for more help from the city. “[The city] can stop this,” Pedro Estevez, president of the United Auto Merchants Association (UAMA), said at the news conference Thursday. 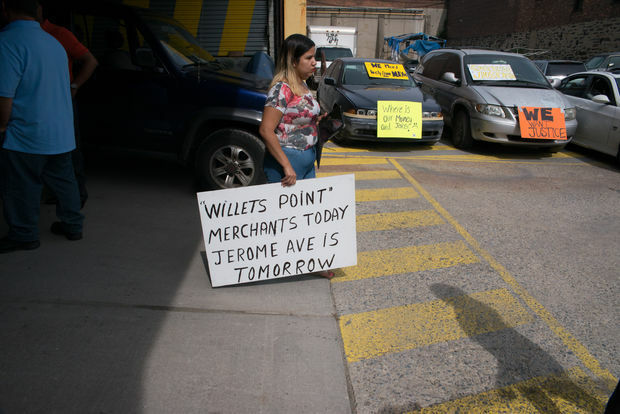 He said other businesses on Jerome Avenue, which are facing displacement from a separate rezoning, will likely face the same fate. City Councilman Rafael Salamanca who represents the area, said the building’s landlord was at fault for not working with both the city and the businesses to find a solution. Calls to the landlord — Advantage Wholesale Supply, a building maintenance supply company — were not returned. He also said the city shouldn’t abandon the workers, many of whom have returned to Willets Point to work at other shops or are on public assistance. The Economic Development Corporation, which is in charge of the Willets Point development plan and oversaw the stores’ relocation, said it’s done “everything in our power” to keep the Sunrise Cooperative afloat. After giving the group $7.5 million to renovate the Bronx warehouse, the agency provided an additional $2.4 million “in yet another effort to help keep them afloat,” an EDC spokeswoman said. But the landlord is refusing to accept the additional cash. “We are surprised and deeply disappointed that the landlord of 1080 Leggett Avenue has been unwilling to accept that offer, and has chosen to evict the co-op rather than work with us to move this project forward,” EDC spokeswoman Stephanie Baez said in a statement. It’s just the latest issue for the Willets Point development plan, which was approved by the City Council in 2013. Sunrise Cooperative, an organization with businesses located in phase 1 of the development area, was the only applicant for the Willets Point Business Co-Relocation Fund, officials said. In March 2014, the group leased 1080 Leggett Ave. with funds from the EDC. 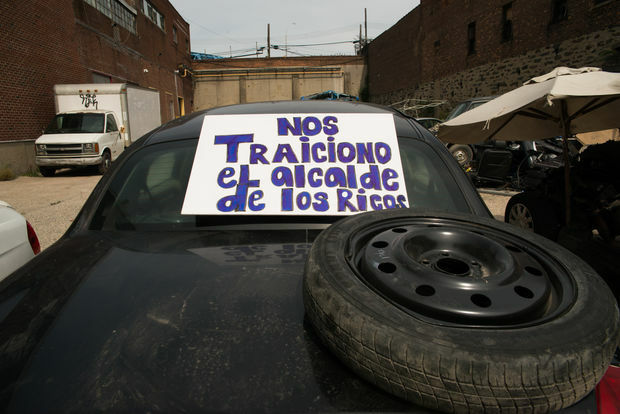 Neira, president of the cooperative, later filed a lawsuit against the city and the developers to secure more funding, but eventually agreed to drop it as more businesses began to leave Willets Point. After moving to The Bronx, Neira said the cooperative found the building had multiple violations, and a plan to build out individual stores for the tenants never came to fruition. Meanwhile, their former buildings in Willets Point have been razed for a development plan that is currently in limbo. At a Community Board 7 meeting Monday, representatives from the EDC and the Queens Development Group — which were selected to develop the site — were grilled about the future of the site after an appeals court ruled against the proposed “Willets West” mall plan. Developers said any work done at Willets Point is contingent on the mall construction, which is now blocked. The entire redevelopment plan could get scrapped by either the city or the developers if they don’t find another way to fund a cleanup of the area. Neira said their long-neglected Willets Point shops had issues, such as unpaved roads and non-existent utilities — but customers still came, and business was brisk. The new building in Hunts Point was promising, but they feel deceived, he said. who represents the area, said the building’s landlord was at fault for not working with both the city and the businesses to find a solution. Calls to the landlord — Advantage Wholesale Supply, a building maintenance supply company — were not returned.